Certainly even, but looks quite deep! 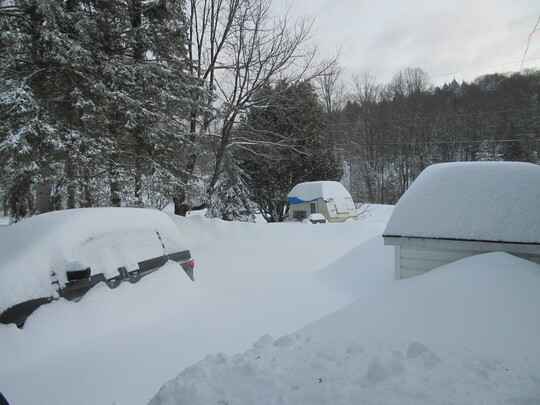 You ve got deep snow there Lori we only had an hour one day and that melted as it fell seems you ve got our snow. the weather is wet and cool down most of the west coast of NA this winter. Friends and family in B.C. are experiencing more snow than ever..and friends in Cal. are talking about the cool wet winter... If it's still wet out there...it will take a while for it to travel across country to us...but we'll have it sooner rather than later. Early March is usually our snowiest period and I can't lift my shovel over my head ... pathways are like tunnels the banks are so high! I wonder if its to do with the earth's magnet polemoving towards Siberia. I'm hoping for a better shake this spring. At least get some apples this year as the buds and blossom have been frozen off in previous years. Found this if your interested to know. Yes Russia hold the most oil and own country's that have a rich source of oil too. I wonder what they all will do when oil runs out. My uncle who was in the army in the second world war who stayed in Singaporearried after the war married a Chinese lady they moved to Australia then visited here about 12 years ago to consider moving back here but said we are all living on top of each other they have let to many in here now he stated then commented about how nature has its ways of getting rid of poison not to do us harm then the greed of man digs it up by drilling and sends it into the air for us to breath in toxic fumes. Even non leaded petrol causes cancers and they will have a nation walking around with all types of cancers according to two London doctor professors when they warned parliament of this and they said they did nt care in the Whale report. This is the geographical poles not the magnetic poles.. Thank you Lori I shall have a look. caused by taken oil out the earth which imo is like taking oil out of our bodies. Global warming is an excuse to tax us all making money for the rich even one of our old chancellors who was chancellor of the exchequer for Margaret Thatcher Nigel Lawson he has his own team on it that has investigated this its a natural course the earth takes and argued this . I ve watched documentaries where they have taken large ice cilinders out of the poles and has shown many ice ages dating back thousands of years and warming which lasts about 30 years. Also scientist on a forum have stated by taking oil out of the earth takes away the protection of the heat escaping and warms the oceans. So I don't believe its fossel fuel as like coal wood etc I believe its the oil.